Graduate of BS Nursing; Must be a Registered Nurse, with updated PRC license; Preferably with at least 2 years of experience as a Healthcare Practitioner/Company Nurse in a manufacturing company; With Occupational Health Nurses Association of the Philippines (OHNAP) certificate of training; Must be of good moral character; Must be computer literate; Willing to work on shifting schedule. Male; High school graduate or College level; With Valid Driver’s License, with restriction code nos. 1, 2, 3, 8 and good driving record; Must be flexible, dependable, time-conscious and able to move from project to project with minimal supervision; Non-smoker. Male; Experience is an advantage; Non-smoker. Male; High school graduate / Vocational; Must be a non-smoker. Male; High school graduate / Vocational; With experience; Must be a non-smoker. Female; At least Senior High school graduate or any course; Preferably experienced Caddie (Management will provide Caddie Training); Part time (Weekends / Holidays) workers or students are welcome to apply; SALARY RANGE : (Part Time Workers – Ph470.00 up to Ph770.00 per day) – (Full time Workers – Ph12,000 up to Ph20,000 per month). Male / Female; Graduate of any 4 year course; With at least 1 year experience in doing office work, preferably in Purchasing or Logistics tasks; With good oral and written communication skills; Adopt in organizing activities to ensure effective results; Flexible and attentive to details. College level; Preferably with training/working experience on Nihongo translation and interpretation; With work experience as a Nihongo Interpreter / Translator and works in a manufacturing company. Preferably graduate of any 4 year Business course; With at least 1-2 years supervisory / managerial experience; With extensive sales training and math efficient; computer literate, customer focus, analytical, decision making skills; Displays good leadership and character that reflects honesty and loyalty; Willing to work on shifting schedule, Sundays and Holidays. High school graduate / College level; Can write and read; Have reasonable verbal ability; Can do basic mathematics; responsible and reliable; good in customer service; Trustworthy; Willing to work on shifting schedule. High school diploma is preferred; Certification from a Vocational At least 1 year experience; Excellent knowledge of mechanical, electrical and electronic components of vehicles; Working knowledge of vehicle diagnostic system and method; Ability to handle various tools and maintain equipment in good condition; Willingness to observe all safety precaution for protections against accident, dangerous fluids, chemicals etc. ; Excellent physical condition; departments while controlling expenses and maintaining customer satisfactions; With Driver’s License. Fresh graduates are welcome to apply; Assists mechanics with repairing vehicles and equipment; Ability to handle various tools; Pick up supplies and parts from parts department as per request by head / lead man; Excellent physical condition. Male / Female; Preferably BS Custom Administration graduate; Fresh graduates are welcome to apply; Goal driven and can work under pressure; Good communication skills; Computer literate and proficient in MS word and MS Excel. College graduate of any Engineering and computer related course; Computer literate; With OSH related experience is an advantage; Can prepare and analyze report. At least College level; With experience in Warehouse / Import / Export process; With experience as planning and/or administrative position; Physically fit, flexible and hardworking. Must be graduate of BS Accountancy; With noteworthy years of internal and/or external auditing experience; Must be proficient in Microsoft based applications; CPA / CIA designation with related work experience is desirable but not required. Graduate BS Accountancy or BS Electrical Engineering; Computer literate; With OSH related experience is an advantage; Licensed Mechanical / Electrical Engineer is an advantage; Can prepare and analyze report. Graduate of any 4 years’ course, BS Criminology is an advantage; At least 5 years’ experience in related field; Must be proficient in computer and office equipment; Able to write reports and describe situation effectively. Graduate of 4 years IT related courses; At least 1 year experience in programming; Must be proficient with programming VB, PHP, Networking and PC troubleshooting. Graduate of BS Accountancy; CPA is an advantage; With experience in accounting related function. Graduate of any 2-year course; Can read and speak Japanese; With or without related working experience; Knowledgeable in computer; Can work with minimum supervision, and can work under pressure and self-motivated. Graduate of any Four-Year Course; With related working experience in manufacturing, good in oral and written communication; Self-motivated and can work under pressure and with good leadership practice; Should possess good analytical skills; Computer literate; Willing to render overtime and holidays and Sundays. Graduate of any Four-Year course; Preferably with experience in the same position, Computer literate; Should possess good analytical skills; Good in oral and written communication; Self-motivated and can work under pressure and with good leadership practice; Willing to render overtime and holidays and Sundays. Graduate of BS Electronics, Electrical and Computer Engineering for QA Engineer; With prior experience as QA in a manufacturing company is an advantage; Must have good analytical & communication skills; With good moral character & interpersonal skill. Must be a graduate of BS Electronics and Computer Engineering; Must have a background in usage of AutoCAD and other CAD Software; Experience in Automation Project Creation is an advantage; Able to work with minimum supervision; Willing to render overtime and/or Sunday work. Graduate of BS Nursing; Registered Nurse; Computer literate (MS Word, Excel, PowerPoint, and Outlook); Preferably with Occupational Nursing experience; With BOSH Training for Nurses (50 hours) is an advantage; Willing to work overtime, Holidays and Sundays; Can prepare and analyze report. College graduate of any Business related course or Information Technology; Must be computer literate, good keyboarding skills with experience using word and spreadsheet; Experience with or knowledge in Documentation, Planning, Purchasing, procurement and Supply Chain; Strong written and verbal communication skills. Must be a graduate of AB Psychology or any HR related course; With 2 to 3 years’ experience as HR Supervisor in a manufacturing firm; Must be knowledgeable in Philippines Labor Law; With strong effective communication in oral, writing and interpersonal communication; Demonstrates a high degree of confidentiality in interpersonal interaction; With strong commitment to and interest in employee relations and communications. Male; BS or Associate Degree in HRM / Tourism or other hotel related course; Excellent communication skills, a positive and persuasive personality; fluent in English both in oral and written; Well-versed in M Excel and MS Word; Knowledgeable in handling front office operations; At least 1 year experience in the same field. Male / Female; Graduate of BS Accountancy; CPA Passer is an advantage; Must have at least 5 years in service; Must knowledge on supervising employees, maintaining financial records, and assisting with audits. Male / Female; Candidate must be possess at least Bachelor’s Degree in Finance / Accountancy; With or without experience; Ability to maintain accurate financial / accounting records; Can handle pressure; Trainable and with good moral character. Male / Female; Bachelor’s Degree in Psychology or BSBA major in Human Resource Management; At least 1-3 years’ experience in the field of Human Resource and proven work experience as a HR-Benefits; Having knowledge about the process of SSS / PAG-IBIG / PHILHEALTH contribution and loans. Male / Female; At least High school / Senior High school graduate; With or without experience; Willing to work on extended hours and during holidays. Male; With surveillance skills; Knowledge of security operation and procedures; With customer service and interpersonal skill; Excellent in verbal and written communication skills. 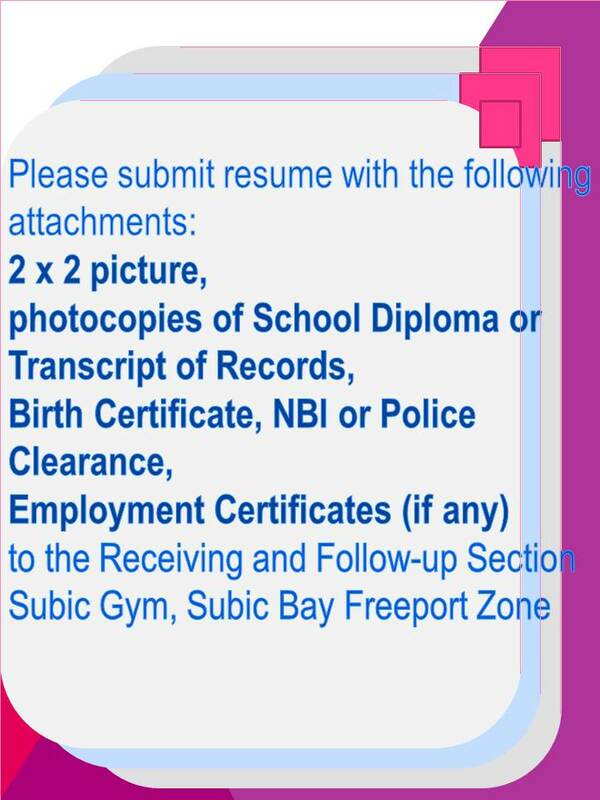 Have a relevant College / University Degree or at least 24 units of education credits; Licensure Exam for Teachers (LET) passer; Fluent in English; Computer literate; Willing to train in progressive methods of teaching. Graduate of Library and Information Science or related field; PRC Board for Librarian Passer; Knowledge and skill in MS Office; Good people relating skills with capability in clear communications; Ability to gain good rapport with administration staff, faculty, and students; Must be a person of integrity, upright moral character, high ethical standard, patient, open to feedback, and always maintains emotional control. Male / Female; Can speak English fluently; Flexible time; Willing to be trained. Male / Female; At least 5’4” in height; At least college level; With good grooming hygiene; With relevant work experience as Cook / Line cook / Assistant cook in fine dining restaurants; Must have knowledge in food preparation; Without any visible tattoo/s. Male / Female; At least 5’4” in height for Male and 5’2” for Female; At least College level; At least with a relevant work experience as Food Server; Excellent verbal and communication is a plus; With no visible tattoo/s and has good grooming / hygiene; Physically and mentally fit, can work under pressure; With pleasing personality and has good customer service. Male / Female; At least College level; Must have relevant work experience as Kitchen Helper; Must be knowledgeable in food preparing; Maintains cleanliness of the station; Can work on a shifting schedule; Can work under pressure; With no visible tattoo; With excellent work ethics; Physically and mentally fit and has good hygiene. Female; At least High school graduate; At least with a relevant work experience as Kitchen Helper; With no visible tattoo/s and has good grooming / hygiene; With work on a shifting schedule; Can work under pressure. Female; At least 5’4” in height; At least College level; With relevant work experience as a Cashier; Knowledgeable in using POS and Credit Card Machine; Physically and mentally fit; Can work under pressure; With pleasing personality and good grooming / hygiene. Male; With construction work experience. BS Accountancy graduate; With 2 years’ experience as Payroll; Computer literate; good in oral and written communication skills. Bachelor’s Degree / college graduate (IT related course); Computer literate ( MS Office); Patient; Good in oral and written communication skills. College graduate of any 4 year course. With 2 years’ experience as Heavy Equipment Mechanic. Male; Knowledge in basic troubleshooting. Male; Knowledge in cutting and fabrication. Bachelor’s/College Degree in Human Resource Management, Psychology; At least a 3-year experienced in the field of Human Resource and proven work experience as a Payroll Officer, Payroll Clerk or similar role; Advanced skills in Microsoft Office suite; Level 3 (Excellent working knowledge) speaking/Reading English language is required; Has excellent interpersonal skills; Ability to multitasks, adaptable, self-motivated, goal oriented; Ability to think through complex processes quickly and understand requirements; Ability to work under pressure, balance the competing demands, work to deadlines. Bachelor’s/College Degree in BOSH Training Certificate; At least a 3-year experienced in the field of Health and Safety; Advanced skills in Microsoft Office suite; Level 3 (Excellent working knowledge) speaking/Reading English language is required; Has excellent interpersonal skills; Ability to multitasks, adaptable, self-motivated, goal oriented; Ability to think through complex processes quickly and understand requirements; Ability to work under pressure, balance the competing demands, work to deadlines. Bachelor’s Degree in HR, preferably Graduate Studies; Minimum 5 years’ experience in a HR Co-ordination role with a Medium to Large Organization; Excellent working knowledge of MS Office Suite; Sound Understanding of payroll would be beneficial; Level 5 (Excellent working knowledge) Speaking / Reading English language is required; Fosters a spirit of collaboration and teamwork; Efficient whilst being Detail Oriented. Tertiary Education-majoring in Accounting; CA or CPA is an advantage; Minimum 4 years’ experience in similar role; Intermediate to advanced skills in a GL accounting software system; Intermediate to advanced skills in the Microsoft Office suite; Demonstrated ability to understand financial statements to Trial Balance; Level 5 (excellent working knowledge) Speaking / Reading English language is required; Organized; Ability to multitask and make good decisions; Ability to work under pressure and balance the competing demands of several managers. Female; Graduate of any 4 years course; Can work under pressure and with minimal supervision; Detail-oriented, have organizational skills and ability to work independently; With at least 1 year experience in sales and marketing. Female; At least College level. Female; At least College level; With experience; With pleasing personality. Female; At least College level; With pleasing personality; Computer literate; With experience in the same position is an advantage; Must be a fast learner, honest, flexible and customer service-oriented; Able to work under pressure and on shifting schedule or overtime. Male; Excellent customer service focus and communication skills; Should have all certifications required to handle food; With experience in the same field; Must be able to “prep” food products, using standardized food preparation techniques; Has the ability to interpret/extract information and/or perform arithmetic functions; Must have a related culinary degree; Schedule varies according to business demands and needs. Male; Graduate of engineering course and /or at least with 5 years related experience with advance knowledge; Accountable for the successful completion of maintenance projects; Attentive listener and good communicator; Responsible for planning, scheduling, conducting and coordinating the technical and management aspects of projects; Dedicated, organized, capable of identifying issues and finding a solution as well as possessing the ability to work well alone; Must know the tools and equipment for each job; Can work independently; Physically fit; flexible; hardworking and with good moral character; Willing to work on a shifting schedule and extended hours; Capable of handling pressures and multiple tasks. Male; At least 5’7” in height; With pleasing personality; With good moral character; Can communicate well in English; Can work on a shifting schedule; Can handle pressure; With experience in the same field. Vocational or Electrical Engineering graduate; With related experience. Mechanical Engineering / Marine graduate or Vocational; With experience in boat / Yacht Services is an advantage; Knowledge on diesel mechanic, heavy equipment; Willing to work under pressure; Know how to drive heavy vehicle. Male; Graduate of any Vocational course or at least College level; Can drive manual and automatic vehicles; Knowledgeable in minor car troubleshooting; Must be familiar with the roads in Metro Manila; Must be familiar with important offices in Olongapo City and Subic Bay Freeport Zone; With experience in manufacturing industries (preferably Japanese company); With experience in driving for Executives; With good moral character; Articulate and has good communication skills; Exhibits strong sense of professionalism; With pleasing personality.